Between the 11th and 16th of February, VMware organised its latest "VMware Partner Exchange" (also known as "PEX"). For the world leader in virtualisation software to meet its partners as well as honour the most deserving companies in the field. Organisation-wise, the 2012 PEX kept all its promises. Nearly 3 200 people from all around the world were present at the gigantic event that took place at The Venetian casino. A massive hotel complex with more than 4,000 rooms, two museums and even its own shopping centre. But back to the subject - The VMware Awards! On February 14th, OVH.com took centre stage when it received the 2012 EMEA* VMware Service Provider Program Award. This Award was presented to Octave Klaba, founder of OVH.com, Helene Caraux, Cloud Solutions Product Manager and Benoit Lavergne, VP of Sales and Marketing. "We're really proud to receive this award, especially since we have only been partners for a year and a half" says Helene Caraux. "We were able to meet the top executives from VMware and there was a good chemistry. All of them were interested in the added-value that OVH.com, as a host, can bring to their solutions." Before the Award ceremony, the participants attended a "keynote speech". VMware chose to do things on a large scale with a 100 ft long screen! Several interesting facts were then distilled, including the fact that an iPad application for vCloud Director was about to be launched, as well as information on forthcoming advances in workstation virtualisation via software like View and Horizon. 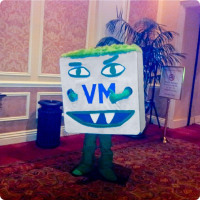 VMware also wants to focus on delivery automation, by the end of 2013. "Something OVH.com already does, as its one of the main points of Cloud Computing", adds Helene Caraux. Finally, the Californian firm wants to explore the development of SMBs (small and medium businesses). VMware acknowledges knowing how to speak to large companies, the "Fortune 100" accounts but not to these SMBs. It therefore relies on its partners to reach this target. A new "skills program" has also been announced to that effect, including training and support in sales to SMBs. * EMEA: Europe, Middle-East and Africa.